Follow your dreams can sound like an inspirational statement and doubtless most of us can recall saying it at one time or another to children, family members or friends. Usually when we’ve said it our motives were prompted by concern. We’ve been attempting to direct the individual’s thought process along a particular path. We may have noticed that he or she was not exactly unhappy, but seemed to be brooding, or looking for a way to break out of normal routine. But were we right in suggesting they follow their dreams; were we being rational. It could be argued that most of us have trouble controlling our own thoughts and passions yet we’re happy to provide subjective advice without access to the innermost thoughts of the recipient. So whilst we meant well the consequences of our advice could be detrimental to those we advise. My mother used to say that the road to Hell is paved with good intentions! Most human beings are subject to their environment and are often oppressed by it; few if any have complete control of the circumstances which they inhabit. This is because the majority of folk need to consider their thoughts and the consequences of their actions on other people. In this day and age it is difficult if not impossible to make life changing choices without affecting those you love or those whom your life touches. One of the advantages of old age is the ability to record and remember changes that the years have dictated. One of the most obvious features of this aging process is the certain knowledge that thoughts, feelings, passions and hence dreams, mutate as time passes. Put simply age suggests that today’s dreams may become tomorrow’s nightmares. So where does all this leave us, is following your dream a selfish indulgence or is it an important element of human existence. Well the real answer is that no one knows, certainly not until after the event. But like everyone else I do have an opinion and following are a few thoughts on the subject. Firstly, I believe following your own passion or dream is a vital part of growing up and is necessary for the healthy development any human being. I should add of course that growing up doesn’t actually stop until the Grim Reaper reminds you that your time is up! You owe it to yourself to use whatever natural talent or ability you have in furthering your own interests. It’s important for your own mental and physical wellbeing, that as far as possible you remain at peace with the world. Having said all that there are few things to remember. 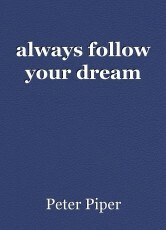 Only you can decide whether following your dream is the right thing to do. Listening to those who encourage you to take a particular course of action can lead to overreaching yourself; we are all susceptible to flattery. Conversely listen to those who discourage and you may never take the plunge. Following a dream is an intensely personal decision. The process I would contend involves you learning to think for yourself and not rely on others. So to follow one’s dream is vital but it could intrude on or disrupt your pursuit of happiness, simply because it may override social interactions and family ties. Another aspect to bear in mind is the subtle difference between pleasure and happiness. On the one hand pleasure is fleeting and external but happiness tends to be more permanent and internal. Both of these states are important and need to be understood. Pleasure and happiness have a profound affect our relationships but can often be confused. In particular the pursuit of pleasure whilst exhilarating, can overwhelm the senses and distract the unwary. And finally, does any of this really matter. The answer is probably no. Almost no one thinks about following their dream, usually it’s an instinctive reaction. To use a colloquialism they go with their gut. Perhaps that’s the right thing to do; after all instinct is often more reliable than any thought process we can employ. To fall back on a cliché; you will make nothing in this life unless you make mistakes. So my advice would probably be, trust yourself, but try to cultivate at least one friendship that will help you pick up the pieces in the unlikely event that the excrement collides with the cooling system.